Grounded by Marriott's physical limitations, the stage version of Disney's magical nanny proves less than practically perfect. On Broadway and on tour, Disney Theatricals' adaptation of Mary Poppins managed to approximate the 1964 film's whimsical blend of live action and animation with lavish production elements and inventive stagecraft. Even the most cynical audience members could be wowed by the live actor playing impish chimney sweep Bert being made, in the climactic tap number "Step in Time," to dance up the side of the proscenium and then across the top of it, upside down. No such magic is available to director Gary Griffin at the in-the-round Marriott Theatre, which as a venue is practically imperfect in every way to make you believe a woman can fly. We know Mary (Summer Naomi Smart, doing a solid vocal impression of Julie Andrews) is never going to lift off, there are no quick cuts or big transformations when stage furniture must be rolled up and down the aisles, and there's little awe in seeing a statue come to life when we saw him clambering into place in full view before striking his marblesque pose. Griffin does what he can to open up the space, surrounding the space above the stage with screens for Mike Tutaj's video projections, which are rendered as flat, 2-D cartoons—perhaps to recall the film's hybrid nature. Mary achieves flight only onscreen. Marriott's production still manages striking notes, sometimes through sheer size. When choreographer Alex Sanchez packs a dozen dancing sweeps onstage with Bert (Bernie Yvon), Mary and her charges Jane and Michael Banks for an athletic "Step in Time," you're almost thankful for the lack of scenery. If Yvon's Bert is a tad too cloying, the poised and proper Smart is a smart match for Mary. Rebecca Finnegan chews into the role of a malevolent nanny nemesis with verve, and the kid actors playing Jane and Michael on opening night, Madison Gloria Olszewski and Johnny Rabe, are remarkably confident (they alternate performances with Caroline Heffernan and Brady Tutton). Rabe, who played A Christmas Story's Ralphie on Broadway last season, shows impressive comic timing. And yet stripping away all the big-budget razzle-dazzle also lays bare a weakness of the adaptation. In translating another 1960s Disney flick with a Sherman Brothers score earlier this year, director Mary Zimmerman added little music to The Jungle Book that didn't appear in the film—which made it feel onstage like a musical with too few numbers. Poppins takes the more Andrew Lloyd Webber–like tack of filling out the score by repeating the same familiar melodies over and over. (Cameron Mackintosh, the megaproducer behind Lloyd Webber's Cats and The Phantom of the Opera, is credited as a co-creator.) 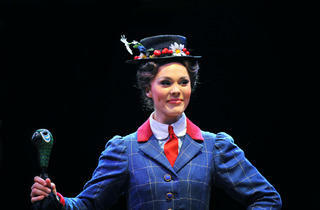 By the umpteenth reprise of "A Spoonful of Sugar," you may be feeling a sugar crash.